Want help getting your blog started? Join me tomorrow for How to Create a Great Classroom Blog. 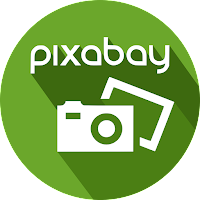 Pixabay is a site that houses over one million free images and videos that have been uploaded by users around the world. All content found on the site is licensed under a Creative Commons CC0 license which means that you can use any of the content in any way you wish, even for commercial purposes. Each image and video uploaded to the site is manually approved to ensure it does not violate Pixabay's guidelines. Content that is adult-themed or depicts strong violence is not accepted, however sometimes images that might be offensive to some do not violate the guidelines and therefore are found on the site. Pixabay offers several ways to deal with images that are not appropriate in schools. They offer a safe search option, which allows a user to turn on safe search on a browser level. Pixabay also offers an option that allows teachers to share a URL with their students which will prevent them from turning the safe search option off. Another option is for the IT department to enforce SafeSearch on the entire network by updating the current DNS configuration. It's important for students to have places where they can find content and use it legally. Pixabay offers districts a way to make this popular resource safe for students to use. 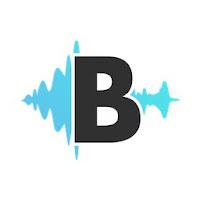 AudioBoom sent an email to their users this morning to inform them that the free AudioBoom plan is being eliminated. Moving forward the cheapest plan will cost users $10 per month. If this news leaves you looking for an alternative to AudioBoom, try one of the following options. Through TwistedWave you can create and edit spoken audio recordings from scratch. Your completed tracks can be exported to Google Drive and SoundCloud. If you have existing audio tracks in your SoundCloud or Google Drive account you can also import it into TwistedWave to edit those audio tracks. TwistedWave's audio editing tools include options for fade-in, fade-out, looping, sound normalization, and pitch adjustments. The editor also includes the typical track clipping tools that you would expect to see in an audio editing tool. Mic Note is a free Chrome app that allows you to create voice recordings, text notes, and image-based notes on one concise notebook page. The notes that you record with your voice can be time-stamped by clicking on your Mic Note note page while you're recording. You can also take notes without recording any audio. All notes support inclusion of images and links. The best part of Mic Note is that you can sync all of your notes to your Google Drive or Dropbox account. Vocaroo is a free service that you can use to create short audio recordings. Creating a recording on Vocaroo is a simple process that does not require you to create an account or have any special browser plugins. Just go to the site and click record to get started. SoundCloud's Android and iOS apps no longer have the recording features that they used to have, but the browser based version still offers a recording tool. After recording in your SoundCloud account you can grab the embed code for any of your recordings. AudioPal is a free service that anyone can use to create short audio messages to embed into blog posts. AudioPal offers three way to create messages. You can record using the microphone connected to your computer. You can record by calling AudioPal's phone system. Or you can create a message by using AudioPal's text-to-speech function. Most of us could use more money for our classrooms. Whether we need to by basics like tissues and glue or we need funds to take students on a field trip, there is grant money available that can help us out. I have done some research and want to share some of the sites I have found with you. You will still have to invest the time to apply, but hopefully this post will save you some valuable time. One thing to keep in mind about grants is that many ask for very similar information. Keep this information in a Google Doc so that it is easy to get to. You can easily keep track of demographic information in a Doc as well. Just remember to update it each year. Tech & Learning Grants Central - This website provides tips about writing grants as well as links to grants that are posted by their deadlines. CenturyLink Grants Teachers and Technology Grants- this is open to all educators who live in a region this is served by CenturyLink. A simple series of questions at the beginning of the grant will tell you if you are qualified or not. DonorsChoose- This service can be used to request funds to improve your classroom or for professional development. There are a few steps involved when setting up a DonorsChoose project, but it is a really good program. Teach.com Grants- List of 20 grants available to teachers. EdTechTeam Grants- Apply to bring PD to your school. Edutopia Big List of Educational Grants- this list is updated on a regular basis so make sure you check back every few weeks for new opportunities. GrantWatch- Searchable list of grants for teachers. Grants.gov- hundreds of grants specifically for education. TeachersCount- Dozens of grants that include a description, deadline, and maximum award. Google Tour Builder was originally created for veterans as a tool to record and preserve their experiences and memories in the military and share them with friends and family. 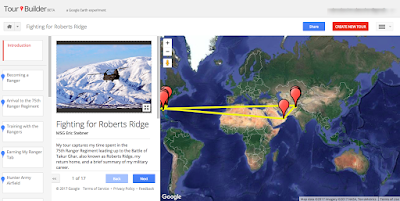 Google made Tour Builder available to everyone because they know everyone has a story to tell. While Tour Builder isn't as popular as Google MyMaps, it has some features that make it a fantastic option to use in the classroom. 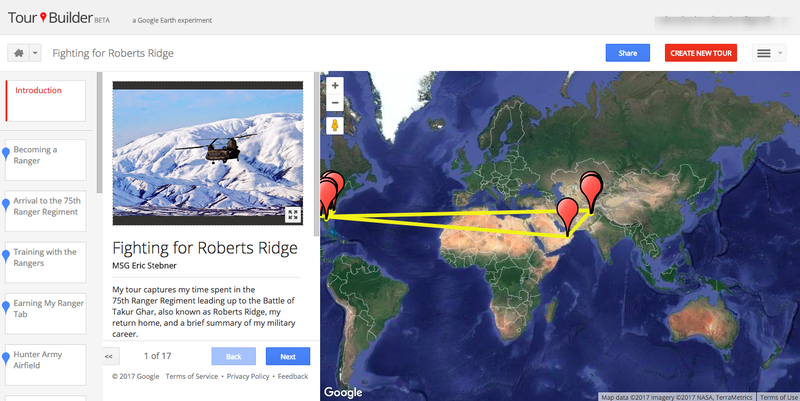 Each marker that you add to the map becomes a new place for you to share text and up to 25 images or videos. These markers can stand alone or they can be linked together with lines to help guide people through your story in a particular order. You do have to have a Google account to create a tour in Google Tour Builder, but you do not have to have an account to view a tour. My favorite feature of Tour Builder is that you can drag Pegman to any location where Street View imagery exists and explore at street level. One of the other exciting features of Tour Builder that was released recently a feature that allows you to open a tour in Google Earth with just one click! To do this all you will need to do is click the menu button and select the "Open in Google Earth" option. Want to learn more? Here are some additional resources that will help you get started building your first tour. TourBuilder can be used to summarize books, add new twist to current events, tell the story of your life, or anything else you can dream up.